Ανακαινισμένο το 2015, το Pine Villa εγγυάται στους πελάτες του μια ευχάριστη διαμονή είτε βρίσκονται στη Οζάκα για δουλειά ή διασκέδαση. Μόνο 10km μακριά, αυτό το 1 αστέρων ξενοδοχείο είναι εύκολα προσβάσιμο από το αεροδρόμιο. Από τη βολική της τοποθεσία, η ιδιοκτησία προσφέρει εύκολη πρόσβαση σε κορυφαίους προορισμούς της πόλης. Το Pine Villa προσφέρει επίσης πολλές εγκαταστάσεις για να εμπλουτίσετε την διαμονή σας στη Οζάκα. Αυτό το ξενοδοχείο προσφέρει πολυάριθμες εγκαταστάσεις για να ικανοποιήσει ακόμα και τους πιο απαιτητικούς πελάτες του. Η ατμόσφαιρα του Pine Villa αντανακλάται σε κάθε δωμάτιο. Στην ιδιοκτησία θα βρείτε μοκέτα, δωρεάν τσάι, λευκά είδη, θυρίδα, παντόφλες, καθώς και πολλά άλλα. Είτε είσαστε λάτρης της γυμναστικής είτε ψάχνετε έναν τρόπο να ηρεμήσετε μετά από μια δύσκολη μέρα, θα σας ψυχαγωγήσουν καταπληκτικές δραστηριότητες όπως οι γήπεδο γκολφ (σε απόσταση 3χλμ. ), κήπος. Όποιος κι αν είναι ο σκοπός της επίσκεψης σας, το Pine Villa είναι μια εξαιρετική επιλογή για την διαμονή σας στη Οζάκα. Service by Mr.Wang is excellent in all means. We arrived there late, the room is ok but the bathroom shared was really in bad conditions. They didn’t answers, via Agoda, so we had to call them! ( expensive if you don't have a. Japanese phone). Sorry, but wouldn’t book this again! The Pine Villa Hotel was perfectly located for a late arrival of KIX Airport, located only one train stop or a short taxi ride from the airport. The Japanese Style Room was large and well equipped. The shared bathrooms were large and very clean. A large selection of quality bathroom goods were made available. The breakfast was basic but sufficient, with yogurt, noodles and coffee. The staff were friendly and very helpful, offering us a complimentary car lift to the nearby train station. It is worth a stay here just to spend time in their immaculate Japanese Gardens. Many thanks for your assistance which made the first night of our Japanese adventure a special memory. very friendly and helpful staff, arrange pick up and drop off at no charge, kids of the owner keep my 5 year old entertained even they don't speak the same language, suggest to get some food at convenience store otherwise have to bike for 5 mins (not so good risk getting lost later with biking in the dark). Definitely recommend to any transit guests. 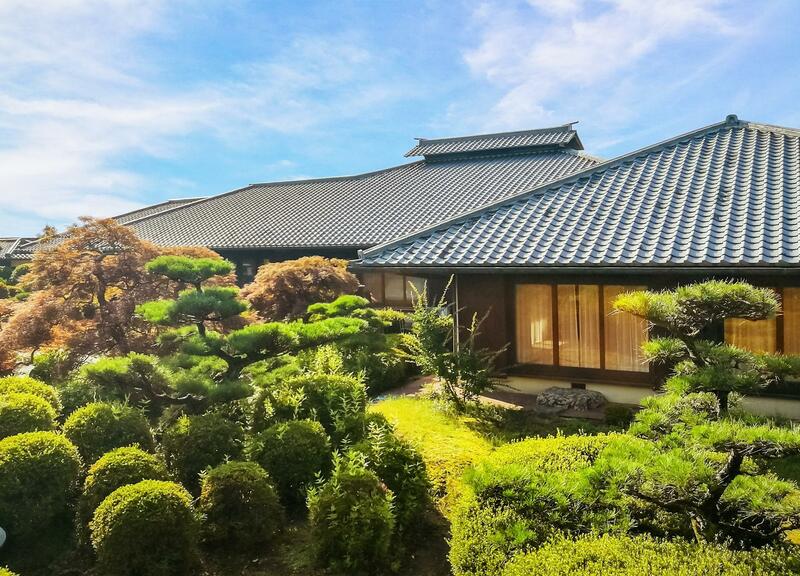 It was a very wonderful and tranquil experience to live in a Japanese house with 100-year old bonzai tree garden, very clean and convenient facilities like new shower rooms and good quality toiletries. The owner couple were very kind and accomodating to us, speaks good english. The location is very ideal for backpackers who want to enjoy the rest of their stay peaceful and relaxing after rigorous tour from temples and train switches. JR Hineno station is just 5 mins drive from the place and just 1 stop away to Kansai airport which is very ideal if you have very early flight. Mr. King offers free pick up from the station. They lend bikes if you want to stroll around the countryside with beautiful sceneries of the house farms and breathe fresh air. Though no taxi around, mr. King was very kind to fetch me from Lawson 1.7km by walking because I wanted to buy dinner. I will never forget their warm hospitality. Thank you so much again! I encourage everyone to try a experience at Pine Villa! We stayed overnight before we caught our early morning flight. This property was much more beautiful than in the pictures. Shuttle service was a nice add on as it is difficult to get to this property from the train station. Just be aware that our room had a shared bathroom which we were ok with. Tranquil surrounding, nice place. Could have been nicer if we spend more nights here. The garden is truly exceptional. Very nice Zen garden. Rooms are big and clean. Highly recommended if you like a Japanese home. The place is not far from the airport, so it's the last stop of our Japan trip, we take a taxi from the nearest subway station, arrive really late but still the owner waited for us, the room is traditional Japanese style, quite large, share shower place, very clean. As we need to catch early fly the next day, did not stay for long. I put the Location as Satisfactory because it's indeed not around hot tour spot, but more like a nice village, have a really serenity neighborhood. If want to stay quite at a traditional Japanese house, this is a great place. This hotel is very clean and love the county side, surrounded with farms and fresh air. No public transport and convenience shop, but hotel providers free transport to train station. Children 6 above need to pay for bed. Communicate with English or Mandarin is ok here. 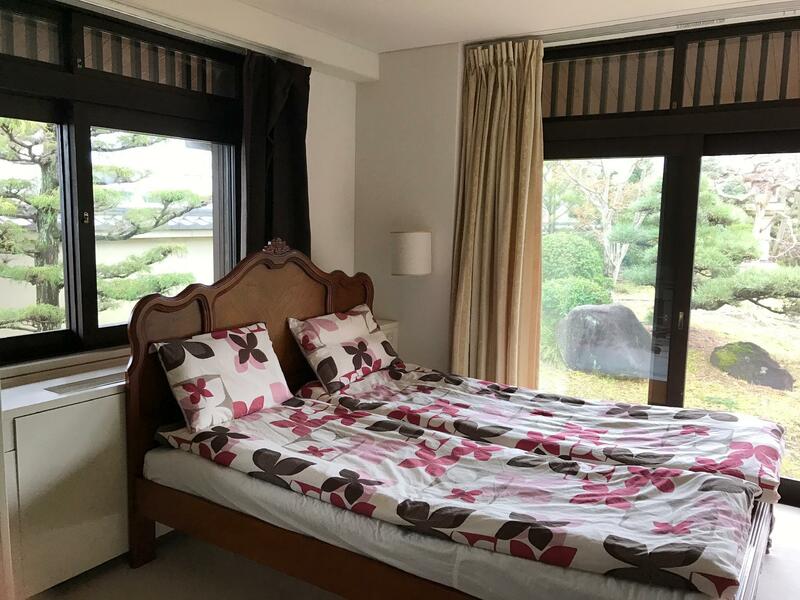 Nice, clean and private Japanese style room with a beautiful garden. The place offers guests a free pick-up and drop-off service from/to the station which is very convenient. A shared bathroom is not a problem. The only 2 issues are, first, there was no pajamas for guests as other Japanese hotels do, Two, the free breakfast they mentioned were a cup Ramen and one Onigiri. Other than that everything is fine. Will definitely visit again! We arrived Kansai Airport around 2300. Mr. 尹 was very helpful and drive us back at JR 日根野 station. 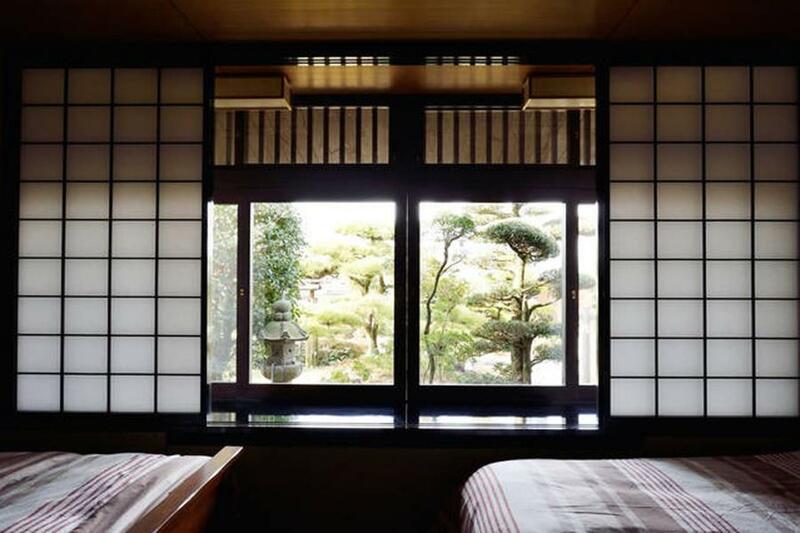 Pine Villa is very traditional Japanese style for foreign tourist. That villa was a Japanese CEO's villa once, and changed to a guest house now. 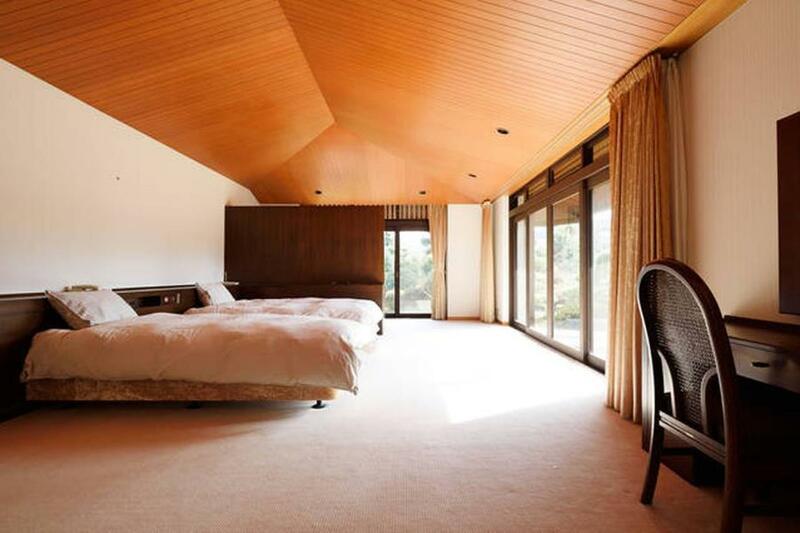 If you watch Japanese Drama, Pine Villa is a place like CEO's living place, everything is grand. By morning, we walked around the Japanese style garden. There is a peaceful place. If you drive your car to travel, it will be better for transportation. Whilst it was a cool experience staying in traditional Japanese style house (the kitchen, the bathroom, living room are quire interesting), location is inconvenient. Noises can be heard from the other room > not good for a good night rest. Recommended for those who seek new experiences and don't mind noises at night. The guest house and grounds are lovely but...... There is no restaurant or shop in the hostel or in the village in which it is situated. We didn't know so went hungry! The 'western' style bedroom was huge so we would have expected an 'en suite' bathroom rather than having to pad off down the corridor. Apparently there is a breakfast starting at 8.30am but this was much too late for us with a morning flight to catch so we went hungry again. .
the host is very friendly and willing to offer great help. he offers rides to and from the train station that is not far away. convenient location, great hospitality and a very great Japanese experience. Huge room, very clean and with great view. highly recommended to those who would like to have a Japanese cultural experience. We were very stressed that from the time of booking the accommodation till the arrival at the airport, the host did not respond or reply to our email or whatsapp messages or whatsapp call. We couldn't get confirmation whether the host was picking us up from the station, whether the room was available or whether we needed to book another place. The host only pick up our call when we used a public phone at the airport. We had a great time in Osaka but this was the most stressful experience we had to encounter. We had a very pleasant stay in the hotel. Mr. Kin picked us up from airport at 1am. Really appreciated it. The house is a unique place. It is a traditional Japanese residence building with about 10-15 rooms. There are 2 or 3 shared shower rooms and toilet rooms. They are neatly maintained. The surprise comes in the morning - after a simple but delicious breakfast, taking a stroll in a huge and well maintained garden with fresh air is really relaxing. Mr. Kin is very attentive to all of his guest's needs. We had one night pleasant stay in Pine Villa. Will stay again when we go near Kansai airport. Pine Villa is peaceful, elegant, and spotless. Mr. Kim, multilingual, picked us up at Hineno Station after a long day. Morning meditation in the garden followed by traditional Japanese breakfast made our stay seem longer than one night. This accomodation is a small and humble one. It is located near the airport around a village, the environment is peaceful and quite, however it does not have any facilities and the nearest mall is 25 min walk away and 1 train ride away. But they do cater breakfast. The staffs there are great and helpful. They will fetch you from the nearest station when you arrive and sent you there when you leave. This is best if you arrive late at KIX airport and wanted a place to stay for the night before you start yout trip in osaka/kyoto. There is around 3 - 4 staff there but only 1 young one who can understand chinese and english. The rest of the staff will also try their best to convey what they want to say with hand gestures so do be patient with them.